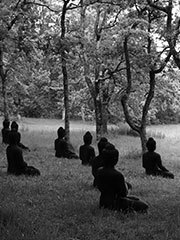 Plum Village is a Buddhist meditation center in the Dordogne, in southern France. It was founded by Vietnamese monk Thich Nhat Hanh, and his colleague Bhikkhuni Chan Khong, in 1982. After being refused the right to return to Vietnam, Thich Nhat Hanh formed a small mindfulness community 100 miles south-west of Paris called the Sweet Potato, the food that poor Vietnamese eat. Following Thich Nhat Hanh’s expulsion from Singapore following illegal attempts to rescue Vietnamese boat people, he settled in France and began to lead mindfulness retreats. In 1981, Sweet Potato community held its first summer retreat, which attracted more people than it could accommodate. Thich Nhat Hanh then traveled south with his colleague Chan Khong to find a larger site. They found a piece of land in Thenac which seemed ideal. The landowner, Mr Dezon, didn’t want to sell, so they continued looking. A few days later, on September 28, 1982, Thich Nhat Hanh purchased a tract of land about 6 kilometers away, which is now known as the Lower Hamlet. Later that year, a hailstorm destroyed the vineyards on Mr Dezon’s property and he was forced to put his land on the market. Nhat Hanh bought the land and called it Upper Hamlet. Initially, these two hamlets were named Persimmon Village, but it soon became clear that plum trees fared much better on the rocky soil, so it became Plum Village. Every year the community hosts a four-week summer retreat, which has grown increasingly popular in recent years. Attendance has grown from 232 people in 1983 to over 2000 people in 2004. Today, Plum Village is made up of four major residential hamlets. Upper Hamlet houses approximately 65 monks and laymen, as well as being Thich Nhat Hanh’s residence. Lower Hamlet houses over 40 nuns and laywomen. Son Ha Temple houses approximately 20 monks, and the New Hamlet, 20 minutes away by bus, houses approximately 40 nuns and laywomen. Plum Village has branches in the United States of America: Green Mountain Dharma Center and Maple Forest Monastery in Vermont, and Deer Park Monastery in Escondido, California. Phone: +33 (0) 5.53.94.75.40 (Please note that due to the monastery schedule, it is better to reach us by email rather than phone).